Why has BALDIE42 been banned,blocked from posting? I thought I’d ask David on line why I have been banned from Hairsite.Blocked from posting. Is it because I have an opinion on certain hair transplant doctors.To close to the truth.It seems ok to knock certain doctors,but not certain ones that adverise on this website. Is it because you are fed up of me having an opinion or is it because your advertisers are running the forum. 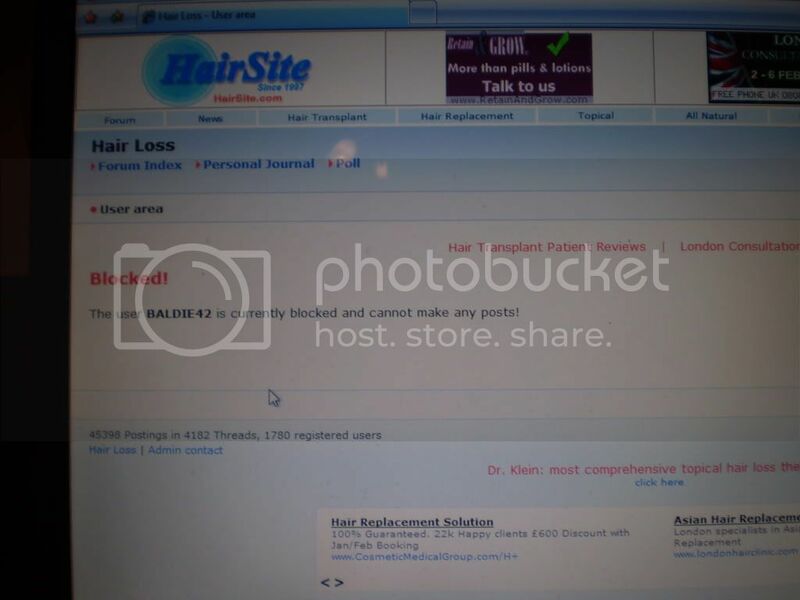 This posting will get deleted and this name I’m using will get blocked no doubt.Freedom of speech is not allowed on hairsite.Just delete,delete,delete then banned - blocked from posting shame on you Hairsite. Hopefully most of you will get to read this before its removed.I just hope the othe hairloss forums I have just registered with are fairer and don’t bow down.